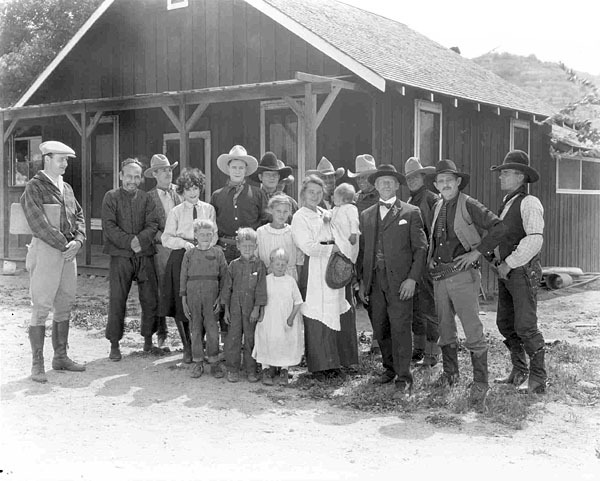 Film crew at the Warmuth home in Sand Canyon, early 1927. (Back row, center): Josephine Warmuth (Ramey), Mrs. Minnie Warmuth holding Mary Warmuth (Sathre), Mr. Joseph Warmuth. (Front row, center): Joseph Warmuth (Jr.), Henry Warmuth, Madeline Warmuth (Davis).